An unbelievable milestone has been reached as Angel Quilts finishes its thirteenth year since getting started in 2000. The three sister churches, Williams Memorial Methodist, First Baptist Moores Lane, and First Presbyterian Church, AR, have together made and distributed over 1000 quilts. It is hard to believe that in these thirteen years that this many cancer patients in the Texarkana area and beyond have received warmth, comfort, and the love of Jesus Christ through this ministry. At the beginning of the formation of Angel Quilts, it was hoped that at least five or six quilts could be made and distributed in a year. It just shows us that when the Lord initiates something and is working in it, nothing is impossible. Angel Quilts started in 2000 in a den of the founder’s home with five committed seamstresses who wanted to make a difference in the lives of cancer patients. Only two of the women actually knew how to quilt, but that did not stop them. After taking lessons together, they started Angel Quilts and were so excited when the first quilt was distributed at First Presbyterian Church, AR. Since that time, Williams Memorial Methodist Church, and First Baptist Church Moores Lane have joined to make a combined effort. From the five original quilters, Angel Quilts has now increased to almost fifty members between the three churches. It is hard to put an exact number to the ministry as there are so many people who do not come to the quilting time but do many things to help at home. Many prayers go with these quilts as they are given to the cancer patient. The quilters are asked to pray over whatever part of the quilt they are working on even if it is just ironing. When the cancer patient receives their quilt, their name is placed on a prayer list and they are prayed for. About six to eight weeks later, hopefully, when their treatments are over, a card of encouragement is sent to them from the Card Ministry at First Presbyterian Church. This makes the quilt different from a quilt that might come from a store. The love of Jesus Christ is shown to them, many times without any words spoken. Many cards of testimony of the wonderful effects of these quilts have been received and are in scrapbooks. Donations are always welcome and go directly to making the quilts for the cancer patient. Materials donated need to be 100% cotton. More quilters are always needed as we have more than 100 requests every year. 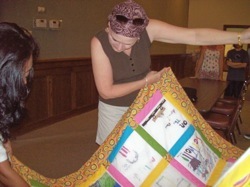 Quilts are even distributed at Relay for Life in May and Race for the Cure in October. No matter what age you are or what capabilities you have, there is always a place for you. Not only will you be put to work, but also will make lasting friends with others who are trying to make a difference in other’s lives. 9:00 – 12:00, and First Presbyterian also meets on Thursday morning from 9:00- 12:00. Contact Ruth Voss 903-490-7293 for Williams Memorial, Anita Owens 903-831-6405 for First Baptist, and Martha Nell Richards 903-838-7106 First Presbyterian for more information. Prayer is still the key to this ministry. Each quilter or helper is asked to say a prayer over whatever part of the quilt they are working on for whomever will receive the quilt. We hope that each cancer patient will feel God’s love and comfort as they are going through this experience. Cards that we receive from these cancer patients give witness of this love. The Lord has blessed these quilting groups in so many ways. When the quilt is given to the cancer patient, their name is placed on a prayer list that is kept current and sent out by the three churches. Many prayers of healing and comfort are said for these patients, and after two months a card of encouragement made by the Card Ministry of First Presbyterian Church is sent out to remind the cancer patients that they are still thought of and prayed for. This is such a wonderful opportunity to extend the message of Jesus Christ to those who need the hope he provides. There is always room for quilters and helpers at each of the groups. Being able to sew is not a prerequisite as there are many jobs to do. Some of the quilters cannot attend but take home things to do. If you can’t do anything else, help to pray for these cancer patients. Remember that Angel Quilts at each of the churches depends on donations to be able to continue making these quilts, and exists because of the Lord and your generosity. Thank you. Currently Angel Quilts is active in three local congregations: First Presbyterian Church, Williams Memorial United Methodist Church, and Moores Lane First Baptist Church. FPC Quilters meet in the Angel Wing in the Annex on Thursdays, 9:00 a.m.-Noon. 1. If you have a person in the Texarkana area who has been diagnosed with cancer and is receiving treatments or will begin treatments soon, call Beth Morgan at 903-791-0349 or Martha Nell Richards at 903-838–7106. 2. We will contact you when a quilt is ready. 3. We will pray over the quilt for comfort and peace for the patient during this difficult time. No skill is required! If you can iron or sew or use scissors, like to do handwork and want to learn about quilting and make new friends and help others, contact Angel Quilts. All quilts are made from donated materials and through money donations. One hundred percent of all donations go toward quilts and quilting supplies. This is a non-profit organization. Angel Quilters Make the Front (and Back) Page! On Wednesday, 13 January 2010, our own Angel Quilters were featured in a front-page article on quilting in the Texarkana Gazette. Congratulations to these women for their faithful service! Staff photo by Evan Lewis of the Texarkana Gazette. 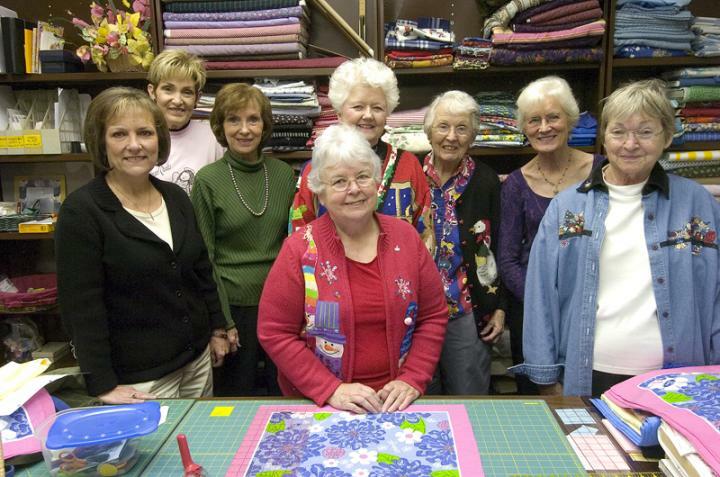 The Quilting Angels are, front row from left, Margo Strickland, Carol Letterman, and Joan Boyles; and back row from left, Beth Morgan, Lil McClerkin, Sylvia Waldrop, Julie Hall and Martha Nell Richards. They piece together their magic masterpieces at First Presbyterian Church in Texarkana, Ark.